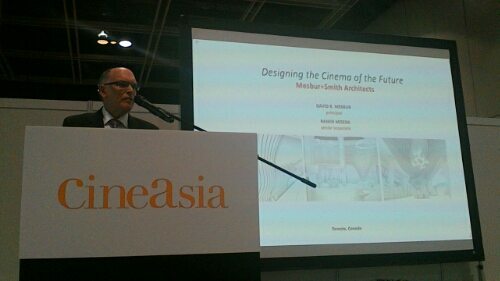 Mike opens by saying thanks CineAsia for including architecture in CineAsia university. “How do we continue to raise the level of cinema going experience?” he asks. “By using set design principles. There is a comfort sitting in the home,” so there is a challenge to get people to leave their couch. “As Jim Cameron said he doesn’t care if people watch his films third or fourt time on a smartphone, but first time should be in the theatre,” Mike observes. Set design – what designers can do to enhance the experince. Make the lobby a key component of the experience. Make the lobby part of the show. Style and atmosphere is one aspect – realistic, minimalist, traditionalist, luxurious, classic or contemporary. Tone is another, colour, shape, rythm of visual elements. Theme – favourite one for architects. Use central metaphore, such as ‘digital glamour’ and another is ‘luxury inside’ – probe deeper to find true beauty. Visual Cues – [this presentation should really be seen with the great pictures Mike is using to illustrate each point.] Seating groupings (better yet, ‘activity groupings’) – Think of different places and how people congregate. Interactivity is the last principle – a whole group of consumers will not be happy with passively watching a film for two hours. So how to cater to them. Final trend is new digital projection expanded offerings – live events, etc. Can customise auditoriums for special requirements, dinner theatres, children’s seating, performing art theatres, class room use cinemas. Without need for projection booth, there is more flexibility in designing the complex. Restaurants and theatres can be co-located. Cinema design is in a period of dramatic change. And with that the 3×15 minute sprint sessions ended. Productive format, so kudos to ICTA.